Trustwave firm published a report related to 2014 incidents that revealed cyber criminal activities are paying with 1,425% return on investment. Security experts at Trustwave published an interesting report on the return on investment related to illegal activities online. The experts revealed that cyber criminals are seeing a significant increase of their return on investment that it has been estimated to be 1,425%. The report was based on data resulting from the investigations of 574 data breaches in 2014. The cyber criminals are mainly exploiting ransomware and Exploit kits to compromise systems worldwide and monetize their efforts. The extortion practice is becoming very popular in the criminal ecosystem and ransomware are the privileged instrument to force victims to pay a fee to restore normal operation of their “seized” PC and data. One of the most dangerous ransomware observed by the researchers is the CTB-Locker, the experts highlighted the importance to avoid payment of the fee because in many cases victims will never get back their files. The exploits kits are used to serve a malware exploiting a vulnerability in a victim’s application, such a the web browser. 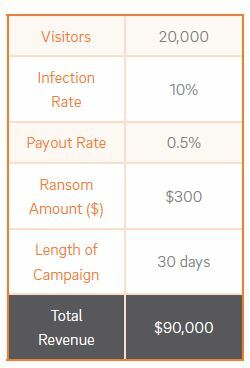 The report states that by investing only $5,900 to launch on a month malware campaign, it is possible to have a return on the investment of $84,100. Among the industries that suffered the largest number of infections there is the retail, PoS systems are a privileged target for cyber criminals. The report states that it has been observed a 14% increase in hackers targeting payment card data over 2013, but most disconcerting data is that 81% of victims did not detect the security breach.